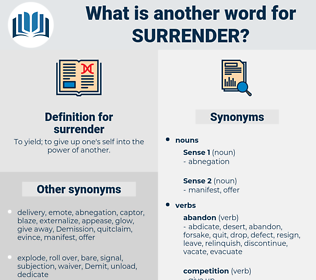 What is another word for surrender? To yield; to give up one's self into the power of another. puts one's tail between legs. withdrawals, identifiers, Remittances, discounts, challenges, rebates, Cells, leavers. Renounced, Proceeded, moved, Toured, Arrived, Sailed, traveled, travelled, Went, Got. renounces, deserts, donates, foregoes, declines, waives, runs, disclaims, Journeys, forgoes, proceeds, moves, appears, Ditches, Drives, Comes, becomes, Travels, finds, feels, continues, goes, heads, Does, gets, makes. lay, renounce, forego, waive, forsake, forgo, succumb, resign, withdraw, give, Gives, concede, furnish, devolve, cease, assign, produce, vacate, discard, donate, subordinate, defer, reinstate, stop, rescind, proceed, lose, bow, repay, refuse, disband. surrendered, renunciation, abandon, handover, transfer, transfers. discontinuations, submissions, postponements, dropouts, transfers. hand-over, cession, restitution, extradite, Retrocession, renouncement, Handing, renunciation, abdication, abandon, handing-over, handover, redemption, desertion, transfer, repurchase, buyback, rendering, discount, postponement. relinquishes, abandons, Leaves, drops, quits, forfeits, visits. relinquish, cede, abdicate, returns, dispense, leave, extradite, render, refund, forfeit, entrust, divest, indulge, desist, abandon, handover, refrain, engage, dispose, transfer, renege, jettison, budge, waiver. favor, adopt, maintain, haunt, occupy, court, cherish, advocate, prosecute, seek, vindicate, undertake, uphold, support, protect, pursue, assert, claim. defend, reject, surpass, conquer, come, hold, refuse, retain, keep, continue. Now look here, Mark, you've got to see that I don't regret my surrender.
" Come ashore, if you surrender," shouted the rebel.